Shayde Burton is made of tough stuff. He comes from a background of gang affiliations, previous convictions and a prison sentence. But this Rotorua dad can no longer be defined by his past. Earlier this year Shayde made the courageous decision to turn his life around, motivated by the desire to become a good role model for his young daughter. The transformation has been profound. Since enrolling at NZ Welding School in April, Shayde has become an exceptional role model not only to his daughter, but also to his classmates, and the entire school. In fact, the training provider has been so impressed that they’ve now offered him a part time job driving the school van – a role he fits in around his Level 3 Engineering studies. “Shayde has shown commitment and enthusiasm to the position and takes his role very seriously. 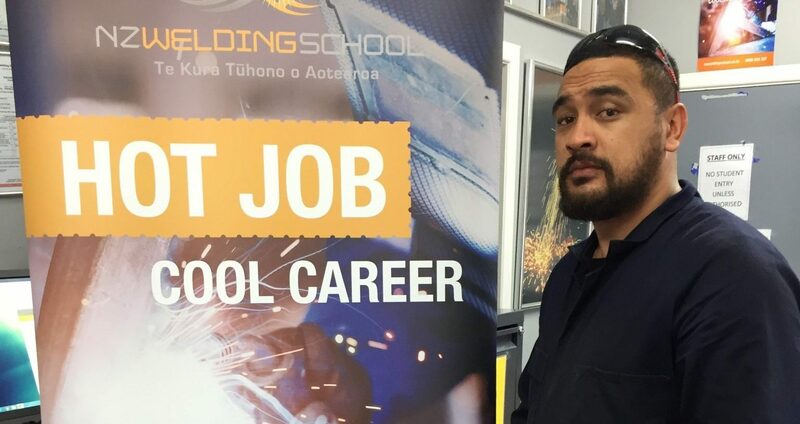 He is now not just a full time student but also a valued member of our team,” says NZ Welding School recruitment facilitator Kayla Kiore. According to Kayla, Shayde’s leadership skills became apparent very early on in the course, and since then he has gone from strength to strength. Recently, in the absence of his tutor, Shayde spent a full day helping his classmates catch up on assignments, enabling the entire Level 3 intake to move onto the next project together as a group. He has taken on other leadership roles within the school too, running a group stand for the Basic Skills Day, and tutoring other students. After completing his Level 3 qualification Shayde aims to stay on at NZ Welding School and gain his Level 4 Certificate in Engineering Trades.